Many times when I decorate my houses I'd often wish I could add a bit more personality to the room. I intentionally seek out animated items for some movement or I use mannequins to give the room a more lively feel, but sometimes times my rooms still feel empty. Plants with their fun personalities and movement are the perfect solution. 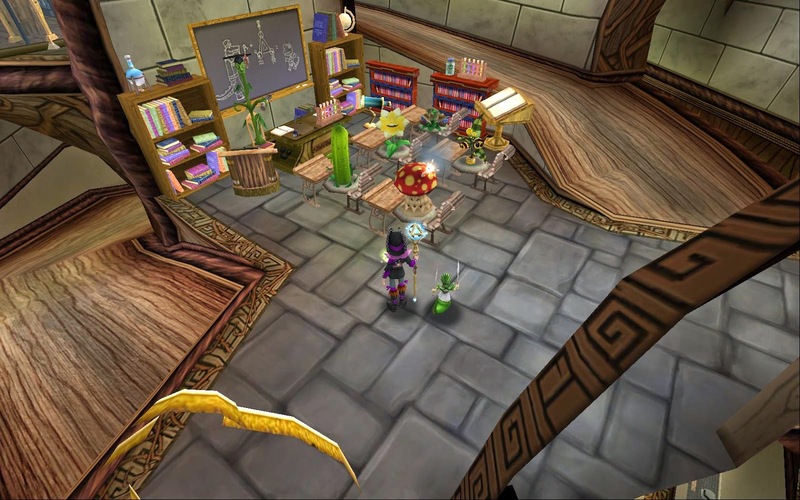 Ever since Roger the Shrubber was introduced in Avalon with his Second Spring spell I have been wanting to make a gardening plant themed house, but real life put those plans on hold for a while. When the new treetop getaway house was introduced I knew it was time to try. I mean where else would plants live but in a treehouse? When I started my project I had a few questions and concerns. How on earth would I get the energy to put all those plants in second spring? How could I take care of all their needs with out spending a small fortune? Grub Guardian was the answer! Using the Wysteria maps I stocked up on Wyverns Hoard packs (for the greenwarden energy gear), energy elixirs, and Moolinda Wu packs. Using these items and a bit time I have transformed my treehouse into a fun animated plant haven. The second spring spell allows you to freeze plants permanently in a mature state once they reach elder. That means there are no longer any needs to take care of and you can use them as a decoration. Most of the time I see people use this spell to give their gardens a permeant like, but freezing a plant in the right area can really bring a house to life. Anyone else keep thinking, it would be really fun to put some couch potatoes in a living room scene? My treetop getaway has over 60 plants frozen in the second spring state. The plants are in every sort of scene from a mundane living room, to a classroom, a western saloon, a zoo, a garden wedding and many many more. This house is currently available on the housing tours under the magical category. Look for Treetop Getaway by Calamity PixieShade. I hope you all enjoy enjoy it and are inspired to add more plants into your homes because they really are quite fun. 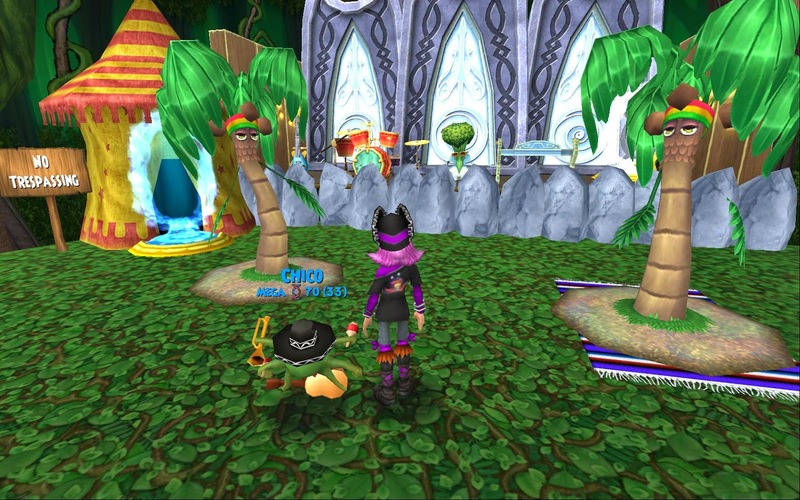 Calamity's house is one of the best in the spiral! The screenshots don't do it justice. Aw, thank you so much! It was a lot of fun to make. Can I just say... wow! I hadn't heard of the second spring spell before, but after reading this I am sorely tempted to create my own "plant house". Calamity's house looks amazing from the screenshots, and I'll definitely be giving it a look under the housing tours. You should! Let me know if you have any questions, and I'll be happy to help. Wow so beautiful and the amount of time and gold invested is phenomenal. Thank-you! I played for many hours trying to figure out how to move the plants around the first time but once you have the hang of it, it will go smoothly. Can you move the plants after using second spring? Unfortunately no you can't. You need to have the plant in place where you want from the moment you plant it. Hi Calamity, I went to visit your house and it's absolutely beautiful. Can I ask a question? How did you make certain plants to have its plot disappear? Use the rug glitch to move it out- (I use a tatami mat, you hover it between the dirt and the pot (Do Not Place) it will glow red telling you, you can't put it there, then scroll the mouse wheel (or use the arrow keys to rotate the mat) *note many times it does not spin, but if you then move the mat, it will bring the pot with you. You can then place the pot on the grown and pick up the pot and the mat. This will leave the seed floating in mid air. You can still take care of it like normal. A word of caution, you may wish to decorate after the plant is in second spring, many furniture items make it difficult to take care of the plant's needs. I need to record a video sometime and illustrate this one. I don't think there is a video out there. It is difficult to explain. I will try to have a video link posted here for you no later than Tuesday. Okay- I love this house SO much. This is honestly the best decorating I've ever seen. Awesome work! Just wanted to let you know how much my son and I loved your two videos about removing the pot from a plant and raising items to a specific height. Nora Nightthief's wyrd house uses the first idea and is still in progress and her Winter Wind Tower used scafolding to lower boats into the water for a boat race and get an energetic crew including bobble heads, mannequins, cat practice targets, and skinny tiki totems. The Winter Wind Tower is up for tour but I'd love you to have you visit our Wyrd House which my son and I designed together. Thanks so much! Happy Wizard101 6th Year Celebration!! 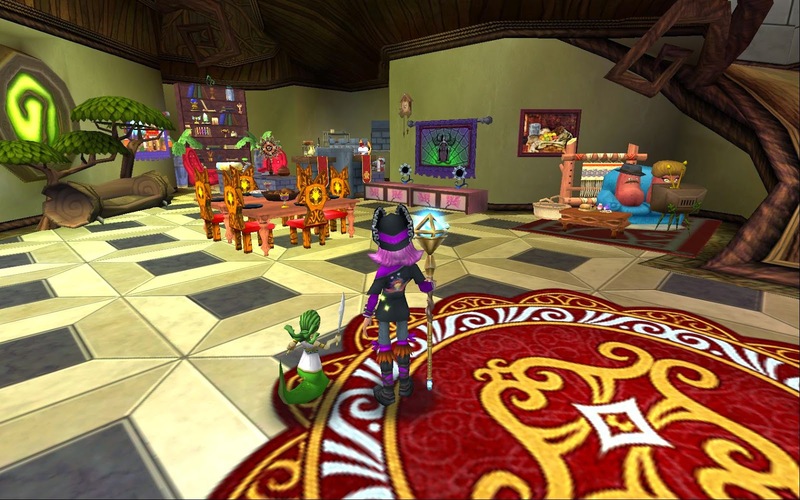 Wizard101 Mini Update-Fun in commons.